SXP: Simplicity, eXcellence, Performance - Walvoil S.p.A.
Walvoil SXP is an innovative directional valve designed for front loaders and other lifting applications. The main feature of new SXP valve is the possibility to switch autonomously from Series Circuit to Parallel Circuit whenever the working conditions make it necessary and convenient. The patented system stands out for its ease of use and above all it guarantees a significant increase in productivity. Thanks to this new system it is possible to overcome the traditional dichotomy between Series Circuit valves (which optimize controllability) and Parallel Circuit valves (which optimize load capacity). 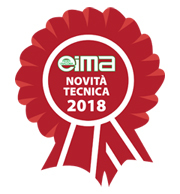 Applied at Eima, Walvoil SXP system will be awarded with the Technical News Award.